Osteoarthritis (OA), the most common type of arthritis, can occur in any joint in the body. OA of the knee is characterized by a gradual degeneration and possible wearing away of joint cartilage in the knee. Healthy cartilage serves the important functions of enabling smooth movement while providing a protective cushion between bones. As osteoarthritis of the knee progresses, protective cartilage wears down and a host of issues including bone spurs and excess fluid can result. Pain and stiffness develop as a result of the changes that take place in the bones and joints with osteoarthritis. Osteoarthritis often develops in knees that have been previously injured, even if the injury occurred years prior. Other factors that are associated with increased occurrences of OA include aging, gender and heredity. Obesity can also be a risk factor due to the excess pressure it places on the joints of the knees. Some symptoms associated with OA are pain and/or stiffness as well as reduced range of motion in the knee. To prevent the need for a surgery, an appropriate hinged knee brace may be worn to mechanically unload the compartment of the knee which has the "bone on bone" arthritis. New technologies such as the Jstim 1000® Therapy System utilize electrotherapy in combination with conductive fabric and infrared heat to reduce the pain associated with OA, opening up new doors for the treatment of the condition. 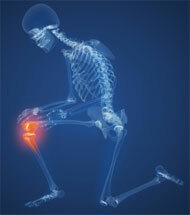 Early diagnosis and treatment of osteoarthritis of the knee is beneficial. If you have or suspect you have OA of the knee, consult your health care professional to determine the best plan of action for your situation. About MMAR Medical Group: MMAR Medical Group Inc. is a supplier of orthopedic medical products including a wide selection of braces and supports. To find a quality hinged knee brace, lumbar brace or other quality brace, please visit www.mmarmedical.com.